Suellen is a painter, community art organizer and art teacher. Although painting has been her passion since childhood. She is also an art teacher and enjoys seeing people come to life as they create. She has created her own unique workshop called Intutive Energy painting.Also she is dedicated to serving the community with access to art, she is a member and cofounder of Walkerville Artists Co-op.Community service is a large part of her career as well as a passionate art teacher and a full time Expressive painter. Collectors and admirers of her work often express feeling a emotional/spiritual connection to her paintings. The artistic influences on Suellen’s work include Van Gogh, Emily Carr and Julian Schnabel. There is evidence of Van Gogh’s impact on Suellen’s work through her use of colour and portrayal of passion. 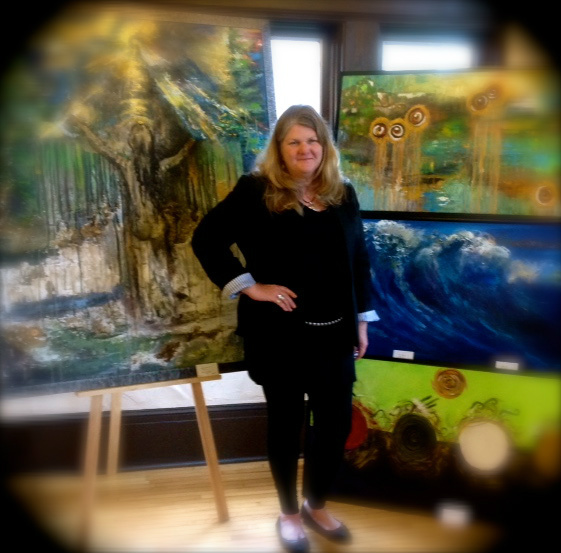 Also influenced by Emily Carr and her connection to nature with a flow of paint to create movement and energy. Lastly influenced by Julian Schnabel, often textured that reaches out to the viewer, can often be found in Suellen’s work. Suellen’s work focuses on the unseen energy interplay around us. She may depict a child caught in a dancing swirl “The Dancer” or a woman naked in nature, reaching to the a higher power in awe “Sightseer”. Also focused on nature speaking to humanity in “The Wave”, or communicating with a city in “S.H.E. sees.” Her work tries to grasp elusive energy, by capturing it with paint through vibrant colour, depiction of movement, and protruding texture. Suellen’s work has patrons in Toronto, Detroit, Lambton Shores and Windsor.She is grateful for the support and encouragement she has received to continue to explore and create.Her passion is witnessing people passionately relating to her work as well as their own.